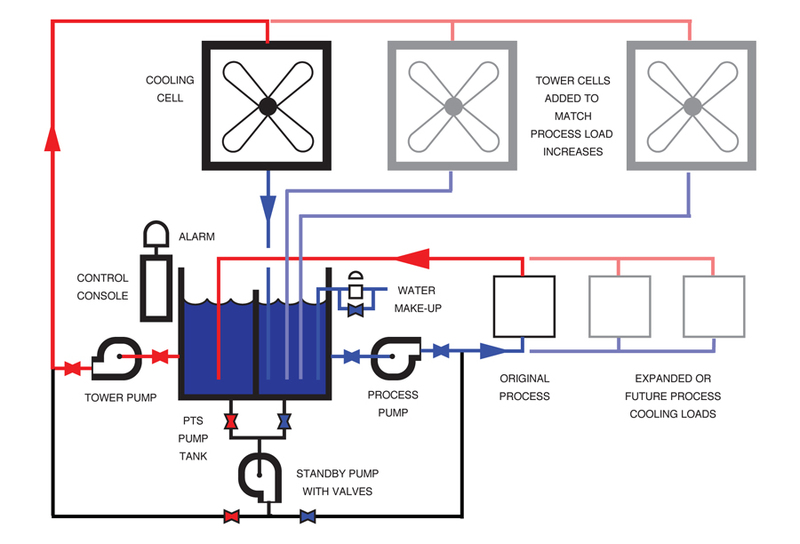 The diagram above serves as a rough schematic indicating the “expandability” of Advantage cooling tower system. An important analysis to be made at the time of the original tower system sale is to have the customer determine his future expected growth. Within certain limits, an Advantage pump tank system can be doubled in capacity in the future. The original pump selections and electrical considerations may, however, not permit simple expansion, unless expansion is anticipated in the original sale. The tank holding capacity is critical to setting the limit of cooling “tonnage” expansion. Therefore, if expansion is anticipated, the original tank sale must be sized adequately. When in doubt, go “larger”... because the initial larger tank cost is modest compared to rework or replacement later. Additional cooling tower cells are easily added, and the tower pump (2 pump systems) may be resized for the added flow rate (2.4 gpm per ton at 10-15 psi). Frequently, only a change in motor horsepower will accomplish this added flow rate requirement. The process pump flow rate (generally 3 gpm per ton at 40-60 psi) can likewise be increased in horsepower. However, frequently this upgrading requires a different pump assembly, therefore, a change in pipe size as well. Pump tank electrics also frequently can accommodate larger motors and the added panel space required for fan starters, etc. Auxiliary motor starter housings can be easily added to the tank in the field if needed. Often, a slightly increased original capital investment substantially simplifies future expansion such that, when expansion occurs, the final system cost is significantly reduced. Advantage components (cooling tower cells, pumps, electronic controls, etc) can also be used to expand competitive brand cooling tower systems. It is not true that the original system supplier must supply the “expansion components” and designs. In all cases, the Advantage Engineering Department should be consulted when future expansion of an existing or proposed system is anticipated. Would you like to Download FYI #006 to your browser?